This Saturday the University Community Farmers Market on the UB South Campus will get a bit bigger as we host Artisan Day, August's special event, one of five on the first Saturday of the month during the market season. Artisan Day will feature some crafters and local artists from 9:00am - 1:00pm. The market begins each week at 8:00am on Main Street at Kenmore Avenue. 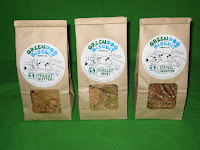 Some of the vendors include Green Dog Biscuits, a local company that makes natural dog treats of organic ingredients. Also in attendance will be Erin Bellavia who does calligraphy and paper crafts. You will be able to find jewelry this weekend too, compliments of Dana Saylor Designs. Her custom pieces for weddings, every day or special occasions are made with Swarovski crystal. Clay and pottery fans can shop from Clayguys, who make polymer clay embellished items such as kitchen serving utensils, salt & pepper shakers, pie servers, and some hand built jewelery which is also made with polymer clay. Regular vendors include Independence Hill produce, jellies, jams and canned goods; McHenry Produce, Kate's Country Cousins; Pasta Temptations; Sweet Greek; and Heaven's Gift Just for You. The market is located on the South Campus on Main Street at Kenmore Avenue. Free parking is available in the Main-Bailey parking lot right next to the market. The market is each Saturday through October 17. Contact UB Community Relations for more information at 829-3099.